It's often through the relationships in your life -- friendships, family, work alliances, love partnerships -- that you learn the most about yourself. One-on-one relationships with others can bring you joy, support, belonging ... but when something's wrong in one of these relationships, it can be devastating to your life and spirit. Whether it's a temporary spat or a major breakup, feelings of confusion, separation, loneliness, or frustration can take over, and close you off to the good things in your life. But they don't have to! You have the power to change your situation. There are some very important Tarot cards that may show up when you need to reconcile a relationship with someone in your life. By identifying the reasons the problem arose in the first place, you'll be able to address the situation, find forgiveness, and move forward stronger than before. The next time you turn to the Tarot for advice about a relationship in your life, keep an eye out for one of these cards -- it may hold a powerful message for you about a relationship that needs to be addressed! Justice is a card about karma and fairness. This card may show up when you are dealing with an imbalanced relationship, or suffering the consequences of a bad interaction between you two. Justice reminds you that you must be equally open to both sides of the situation -- are you doing your part to understand the other's perspective, or only thinking of yourself? 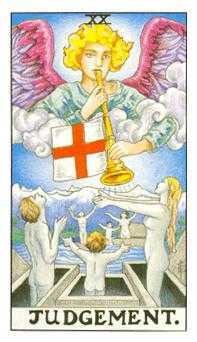 When this card arises, you must open yourself to accepting the truth of your situation -- emotions aside. If you cannot do this, perhaps a third party such as a counselor is needed to mediate, and offer an outsider's practical perspective. You're stuck. When The Hanged Man shows up in a reconciliation reading, you must consider what you can do to get unstuck. In this case, it's not about the other person. This is about YOU. You've gotten yourself trapped in this situation, by thinking and acting in limited ways. To relieve the situation does not require intense action on both parts -- it requires that you open yourself up to more realistic, spiritual, open ways of thinking and living. 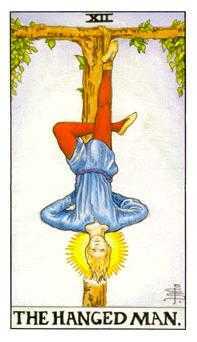 When The Hanged Man appears, only by bettering yourself can you better your relationships with others. Temperance of a card of mixing and moderation. 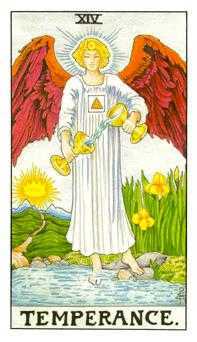 Temperance is a very important card in reconciliation readings, because it reminds you that your relationship is a combination of two people's pasts, present, desires, stresses, joys, fears -- all mixing together. 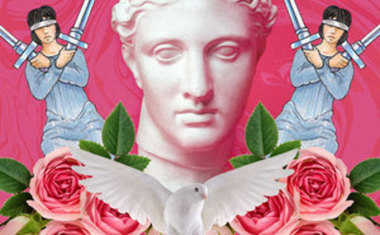 If Temperance arises in your reading, remember to be tolerant in your situation. Everyone acts and reacts differently, and expecting others to act as you would is not realistic. Going to extremes would be a mistake now -- do not cut off ties completely, and do not pressure others incessantly to find a resolution. Do what you can to demonstrate acceptance and openness, and have patience. Some relationships just come along at the wrong time. When a relationship self-destructs, it's for a reason. Sometimes, it's because that relationship was never right, and was never meant to be. Other times, the relationship isn't what's wrong, but the timing. When this is the case, you may find The Tower comes up in your reconciliation Tarot reading. The Tower is an indicator that everything must be torn down as you know it, in order to ever build something new. Relationships that ended on bad terms, for example, maybe were just a product of circumstance. 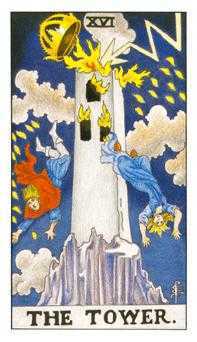 The Tower reminds you that, while a relationship may have devastated your life in the past, it may be the very thing that had to happen in that moment. Now that both of you have been able to move on and grow separately, as individuals, there's a chance you could come back together, completely brand new. 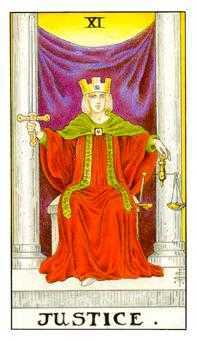 When the Judgment card arises in a reconciliation reading, a major change is needed to move forward. This is like the Judgment Day of your relationship -- a time where you review all the good, all the bad, and the things you could have done differently to create a better outcome. The bonus? Things aren't over. You then have all the opportunity to take your lessons back to your relationship, and actually apply them. Start over. Make healthy choices. Put the past in the past, and do good things for your relationship's future. It will not survive if changes are not made. 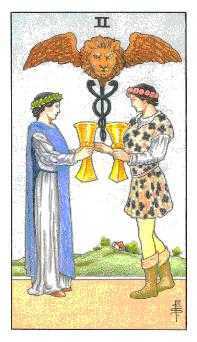 The Two of Cups is a card about balance in relationships. Perhaps one of you is putting more into the relationship than the other, or perhaps one of you is expecting more than they're willing to give. The Two of Cups reminds you that a loving relationship is an equal relationship, where each person feels they receive as much as they give. When this card arises, you must be aware enough to consider your own role in this imbalance -- are you part of the problem? 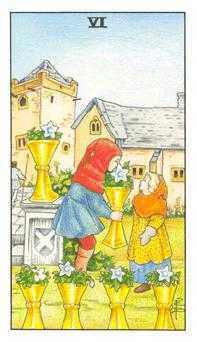 In order to reconcile this situation, the Two of Cups tells you to actively work to create an equal relationship. 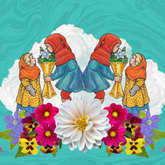 This card is about nostalgia, and indicates people or memories from your past returning in the present. If you've had a falling out with someone, there's a chance they'll reappear when the Six of Cups arises. This may be literal, or you may simply find yourself thinking heavily about this person again, affecting your current life with these past memories and feelings. The Six of Cups advises that you reconcile this unrest by finding closure on your past. Often when we look back, the good things overshadow the negativity we experienced, and we long for false memories. With the appearance of this card, it's time you realize this person was meant to hold a time and place in your life, and there are far better relationships in the future. The Page of Cups is a card about YOU. Pages indicate newness, and the Cups suit is all about emotions and relationships. 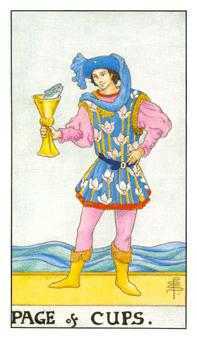 When the Page of Cups arises, it's an indicator that you are experiencing a new way of feeling, and new ways of interacting with others. If you've experienced a rift between you and another in the recent or distant past, this card is telling you that you're a different person now. How you felt about things and how you reacted in past was the old you. Now, with a newer, more mature sense of feeling and openness, these rifts can be reconciled thanks to new perspectives on an old situation.